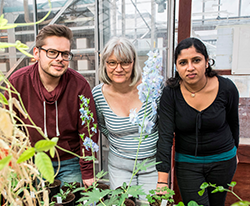 Research led by scientists at the John Innes Centre has solved a long-standing mystery by deducing how and why strange yet colourful structures called ‘anthocyanic vacuolar inclusions’ occur in some plants. The research was carried out by scientists in Professor Cathie Martin‘s group, including first author Dr Kalyani Kallam, and Dr Ingo Appelhagen. Pansy petals, blueberries and autumn leaves all have something in common – their characteristic purple, blue and orange-red colours are all caused by the accumulation of pigment molecules called anthocyanins. As well as contributing to a wide range of plant colours, the patterns and shading caused by anthocyanins can help to guide pollinators towards flowers, or animals towards fruits for seed dispersal. Anthocyanins also help to protect plants against the destructive photo-oxidative damage that can be caused by various stresses including high levels of ultraviolet light. It has been known for some time that anthocyanins accumulate in the vacuoles of plant cells and, being soluble, they are usually uniformly distributed throughout the vacuole. However, previous research has also noted that, in some plants, distinct, densely coloured clusters of anthocyanins can form within the vacuoles. Until now, it was not known how these unusual ‘anthocyanic vacuolar inclusions’ (AVIs) formed – or indeed why. 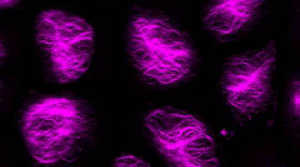 However, a study led by the John Innes Centre’s Professor Cathie Martin and published in the journal Current Biology, reveals new understanding of the molecular mechanisms underpinning the formation of AVIs. Several other John Innes Centre researchers were also involved in the research, along with international collaborators from China, New Zealand and Norway. The tobacco plant (Nicotiana tabacum), which is commonly used as a model organism in plant research, does not normally produce high levels of anthocyanins. However, by genetically modifying tobacco plants to produce proteins from the magenta-coloured snapdragon flower, the team observed the formation of the vacuole-soluble form of anthocyanins. Read the paper in Current Biology: Aromatic decoration determines the formation of anthocyanic vacuolar inclusions (Open Access).